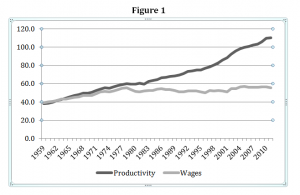 It is well known that while real wages kept the pace with labor productivity up to the early 1970s in the United States, they have lagged ever since, as shown in Figure 1. The causes of the collapse of the so-called Golden Age of Capitalism that allowed for expanding wages in the advanced economies are complex and diverse, but it is clear that the demise of the Keynesian consensus and full employment policies was at center stage. 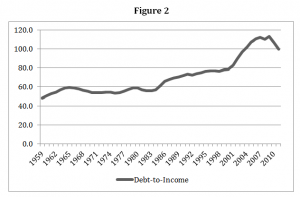 One of the important consequences of the stagnation of wages in the United States has been the increasing reliance on debt as a source of funds for spending. Pivetti and Barba (2009) have argued that rising household indebtedness should be seen essentially as a reaction to stagnant real wages and the cutbacks in the welfare state. In other words, financialization has been the counterpart of enduring changes in income distribution. A point that has also been raised by Jamie Galbraith in his new book Inequality and Instability. Note that increasing inequality has been associated, globally and not just in the United States, with financialization, that is, to the increasing benefits that the Finance, Insurance and Real Estate (FIRE) sector has been able to extract from the rest of society, and with the increased frequency of financial crisis. The graph below (Figure 2) shows the household sector debt outstanding as a share of personal income, and one can see that the debt-to-income ratio starts growing from around 60% in the early 1980s to more than 100% by the last boom and bust cycle, with significant deleveraging taking place only in the last crisis. Also, only in the last cycle, in which mortgage debt skyrocketed did household debt seem to increase without limit. In fact, the deleveraging of the private sector has been the differentia specifica of this crisis vis-à-vis previous ones. In the previous two recessions, which took place after wage stagnation and financialization had already begun, the rate of expansion of private debt had slowed down, but never reversed and became negative. As can be seen in Figure 2 household debt as a share of income never felt until the Great Recession, and this is why the current recovery has been so slow and weak. The significant amount of deleveraging that has already taken place did not cause a bigger crisis because public debt has taken some of the slack caused by the fall of private debt, and public spending, with the resulting fiscal deficits, has replaced, to some extent, private spending. However, as it has been clear for a while now, the increase in public debt has not been sufficient to supersede the negative effects of private deleveraging. It should be understood that the only possible ways to speed up the recovery and reduce the level of unemployment, if the process of private debt deleveraging continues and assuming that with high unemployment wages are not going to recover enough to increase demand, are to enlarge federal government spending or increase public employment directly, on the one hand, or to reduce the effects of deleveraging on households’ incomes. Programs of mortgage relief for homeowners, for credit card debt and for student loans could be intensified, and that would be easier to enact than any significant fiscal expansion. But it must be clear that the effects of those policies cannot compensate for the provision of higher incomes and better income distribution in the long run. In this grim context of the possibility of falling off the so-called fiscal cliff, the tax increases and spending cuts slated to take effect starting in January totaling around $700 billion next year, would be an unmitigated disaster. An austerity program of such proportions would effectively lead to a recession, and unemployment levels that would actually look closer to Depression-era ones (note that actual unemployment levels are already higher than you might think). It is yet too early to be sure whether such a suicidal plan of fiscal austerity would be implemented. But unlikely and irrational austerity plans have been enacted before, and are being implemented right now in Europe. And incredible amounts of money are being poured into the political process to promote austerity ideas. Mind you, I never bought the story that empires fall because of fiscal overstretch, as Niall Ferguson, for example, would have you believe. In particular, that is because most hegemonic countries spend their own currencies, and cannot strictly speaking default, even if they can spend in ways that do not necessarily increase productivity. In that sense, if the US decides to really jump off the fiscal cliff this would be a strange case of imperial suicide.